Arsenal and Tottenham have entered the last few seasons with the same objective of claiming a top four position to ensure Champions League football. Along with the geographical rivalry, competing for similar positions has put increased importance on the direct clashes, and this piece will examine the details of both league clashes. 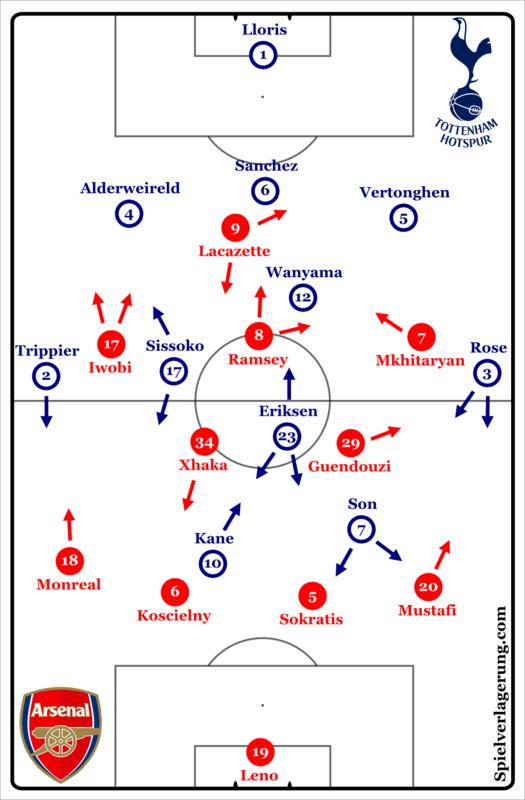 Emery’s men were totally dominant in the first 15 minutes, and this was largely due to a favourable structural interaction between their 3-4-2-1 and Spurs’ 4-diamond-2 structure. Arsenal’s 3-4-2-1 structure was also present when pressing deep into Tottenham’s half. Aubameyang would initially use his cover shadow to block passes into Dier from Lloris. Upon one of Vertonghen or Foyth receiving the ball, the near 10 would run out diagonally blocking the pass into Dier. Aubameyang would now remain high enough to prevent Tottenham using Lloris to switch, whilst being deep enough to have access for backwards pressing in case Dier received the ball. The near wing-back would move up extremely early towards Spurs’ full-back with the aim of having access on their first touch if they were to receive the ball. The near 6 would follow the dropping movement of Tottenham’s 8s, whilst the far 6 dropped to cover the 10 space. Arsenal’s far wing-back wouldn’t drop into the last line, instead moving infield to support the far 6 in protecting the 10 space. In the last line Emery’s men retained a 3v2 advantage, allowing the nearest defender to mark Son or Kane’s dropping movements closely. This was all done at an impressive intensity, and the visitors were unable to build up successfully out of their half. A side effect of Arsenal’s intensity was a conscious effort from Spurs players to pass further away from the nearest opponent, yet this led to ball losses with such passes at times simply going to another opponent or off the field. Spurs’ lack of offensive width meant they lacked a threat in the space behind Bellerin and Kolasinac, allowing them to move out aggressively to press, and even move infield to add to their side’s compactness in the centre. The front two was also simple for Arsenal’s back 3 to control. The away side’s advantage theoretically should have been in the centre with their midfield 4. However, they were unable to take advantage of this mostly due to Arsenal’s impressive movements to compensate. In particular, the cover shadowing from the Arsenal forwards blocking the use of Dier, and the movement of the ball-far wing-back to help cover Alli. The other side of Arsenal’s early dominance was how they were able to progress into Spurs’ half in their possession phases. The away side defended in a 4-3-1-2 shape, but had problems in effectively directing Arsenal’s build-up. The front two waited for passes to one of Arsenal’s wide centre backs to press, however these efforts were let down since the far striker didn’t move across, meaning Sokratis constantly gave an easy back pass option. The biggest issue however, was the lack of access to Arsenal’s wing-backs on both sides who gave easy out-balls from pressure for the home side. Mkhitaryan and Iwobi played high against Spurs’ defensive line, and on the inside shoulders of Davies and Aurier respectively. With this position, and the threat of running behind them they effectively prevented Spurs full-backs from moving out to press these switches. As such, the away side had to wait for Eriksen or Sissoko to move across before having access to Bellerin and Kolasinac. Particularly after switches, this meant Bellerin or Kolasinac could move the team forwards significantly before facing any pressure, as the Spurs 8 had large distances to cover before reaching them. Note the positions of Iwobi and Mkhitaryan. Spurs had to wait for Sissoko to move across before pressing Kolasinac. The runs from the wing-backs, Kolasinac in particular, were also Arsenal’s main source of chance creation, with over or underlapping runs into crossing/cut-back positions, taking advantage of the decisional crisis facing Aurier and Davies. This decisional crisis extended to the final 3rd, with Iwobi open for cut-backs, when Aurier moved out to block crosses from Kolasinac. Around 13 minutes into the game, Spurs made the relatively small change into a base 4-3-2-1 structure, with Son moving deeper to play as a 10 alongside Ali. This seemingly small change was the basis for the dramatic swing in momentum that followed. Pochettino’s switch to 4-3-2-1 gave his side far better access to Arsenal’s build-up. Positioned just outside Xhaka and Torreira, Alli and Son could threaten passes from Arsenal’s back 3 into the midfield pair. Their positions also allowed wider starting positions for Sissoko and Eriksen, since the 10s could block the lane from the ball carrying defender to the channels either side of Dier. With wider starting positions, the 8s could now arrive to press Arsenal’s wing-backs quicker, reducing the progress they could make upfield. Alli and Son also had good positions to move out diagonally to press Holding and Mustafi in moments where they sought to increase the pressure on Arsenal’s first line. Since Mkhitaryan and Iwobi still mostly played high against Spurs’ defensive line, they didn’t threaten the spaces behind Tottenham’s 8s, allowing them to move wide freely in pressing. 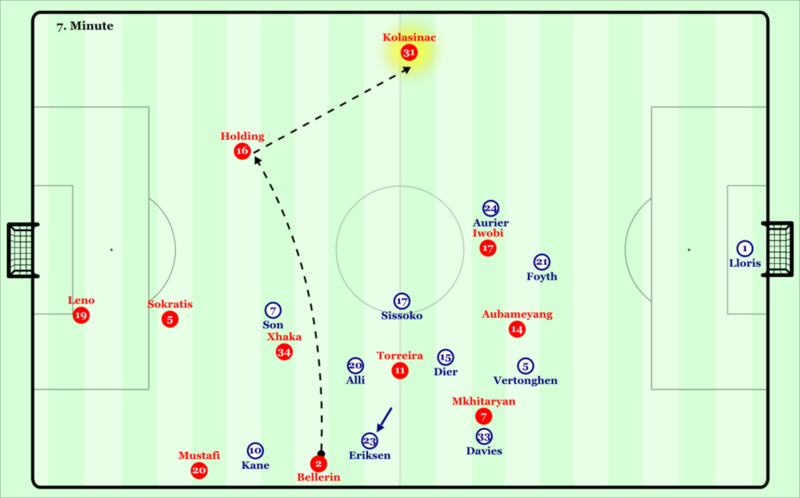 In fact, Arsenal’s best scenes of progression in this period came when Iwobi and/or Mkhitaryan dropped into equal distance positions between the midfield and defence, and could take advantage of the ambitious pressing movements from Eriksen and Sissoko. The change in the South Korean’s position also had significant effects in all aspects of Spurs’ game with the ball. From goal-kicks, his deeper positioning meant he was a problem for both Arsenal’s defensive and midfield lines. Positioned behind Torreira, Son prevented the Uruguayan midfielder from moving up to press Eriksen as quickly as before, with the extra time afforded to the Dane crucial in allowing better progressions. 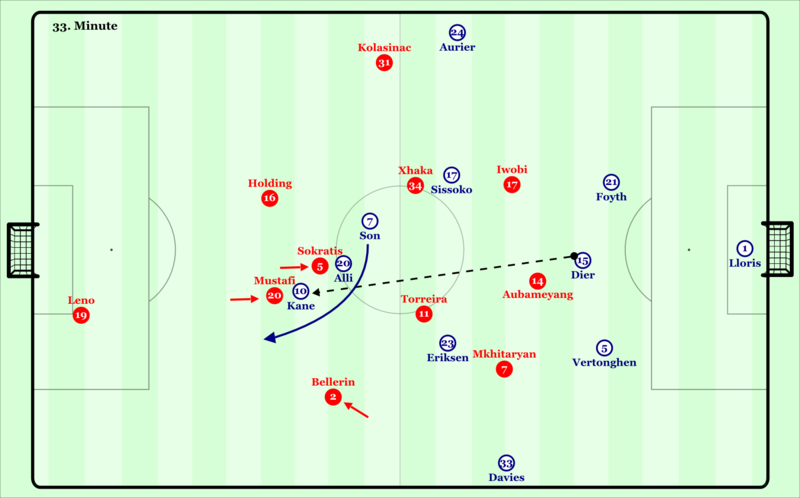 A similar effect was visible in counter attacking situations, where he could either pin Xhaka or Torreira back from joining the counterpress, or escape to wider positions and receive with space to dribble forwards when both Arsenal midfielders joined the counterpress. Offensively, he became even more prominent. Initially as a striker in a front two, he sought to run in behind, from a starting position on the hosts’ defensive line. On a number of occasions, he was caught by Arsenal’s offside trap, or beaten in long ball duels. However, his deeper position contributed to the better overall spacing which allowed the away side to play beyond Arsenal’s midfield line, leading to through balls beyond the defence from closer range. Furthermore, he was better able to avoid Arsenal’s offside trap by starting his runs from deeper. An additional benefit was the increased momentum he was able to gain by the time he reached Arsenal’s last line which led him to breakthrough this line easier. Unsurprisingly, both of Spurs’ goals came from set-pieces which came after a run in behind from Son, a clear sign of just how influential he was in this period of the game. During the interval Emery brought Ramsey and Lacazette on for Iwobi and Mkhitaryan, moving to 3-4-1-2 in the process. The change was seemingly counter-intuitive, without 10s either side of Dier, there was an increased lack of a pinning presence behind Tottenham’s 8s leaving them free to press Bellerin and Kolasinac, and the move to a single 10 would theoretically be simpler for Dier, as a lone pivot, to control. The first few build-up scenes followed a similar pattern to the first half, with Sissoko and Eriksen taking wider positions and moving out early to press Arsenal’s wing-backs. However, Emery’s idea became more apparent in the following minutes. The hosts now increasingly focused their build-up on the right side, with early passes into Bellerin. Torreira moved wider and higher to support than in the first half. Kolasinac pushed far higher, usually against Tottenham’s last line, particularly when the ball was on the right. Aubameyang and Lacazette played in the channels between Spurs’ centre-back and full-back on their respective sides, with Ramsey centrally behind them. These positional adjustments created a number of potential options. In situations where Dier moved up to press Torreira when Bellerin had the ball, he would leave Ramsey free in the 10 space, with Aubameyang, Lacazette and Kolasinac ready to run behind the last line from different angles. 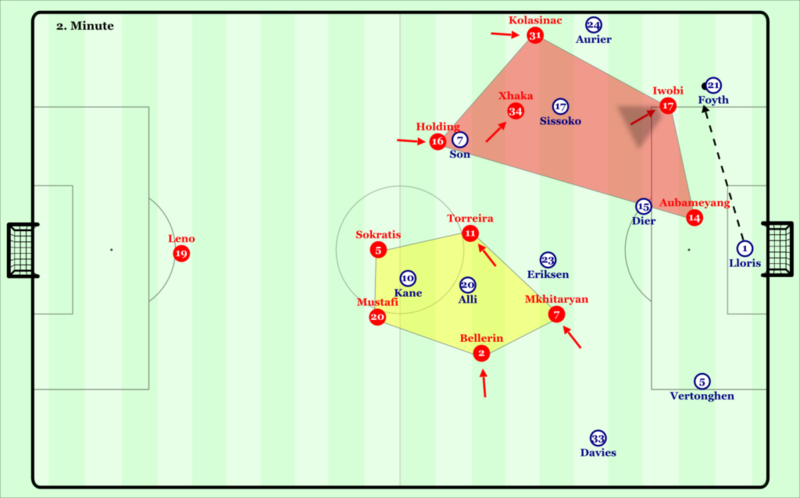 If Dier remained deeper, Torreira would be open to receive infield, and switch to the left side where Kolasinac remained high and wide, with Aubameyang on Aurier’s inside shoulder making it difficult for the Ivorian to move wide to defend. Lastly, if Dier pushed up, and Sissoko covered him well, the space on the left side for switches would be increased. 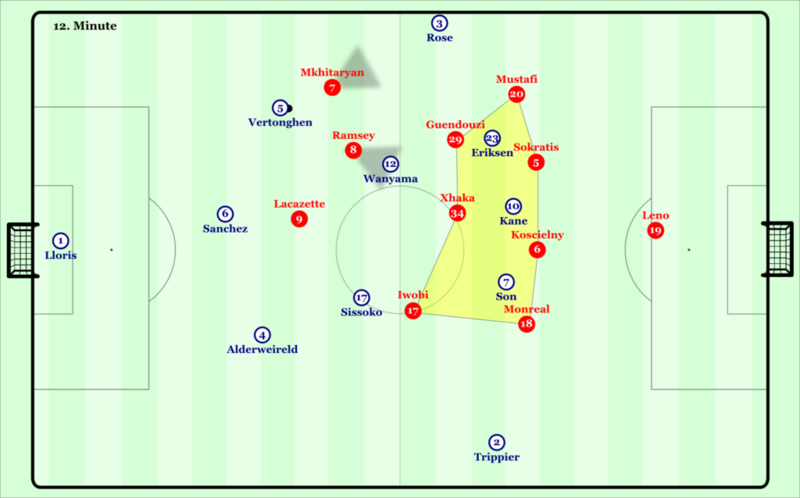 Offensively, Arsenal aimed to take advantage of a problem the away side experienced throughout the game; the distance between the centre backs. With Kolasinac or Bellerin on the ball, the near striker would run diagonally behind the respective Spurs full-back. This movement caused the near centre-back to move across to a covering position. Potentially concerned about the striker on their outside shoulder, Tottenham’s ball-far centre-back was slow to move across, leaving a large gap between them. 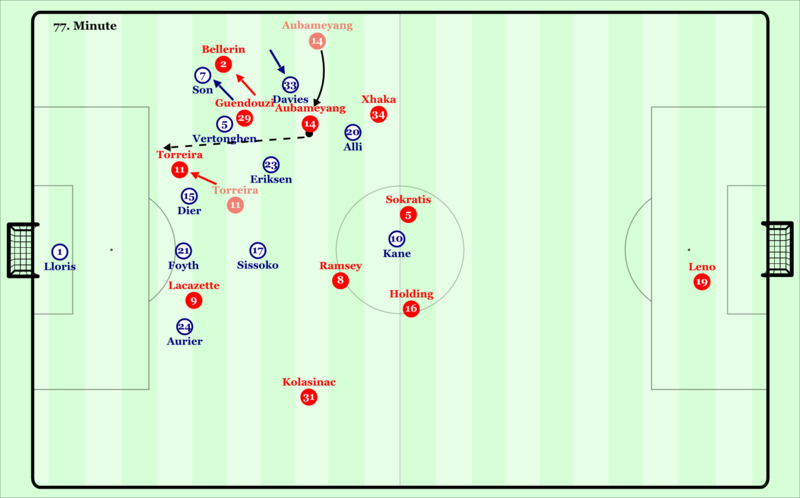 Arsenal’s equaliser came from one such situation, with Ramsey from his central 10 position quick to spot the gap between Vertonghen and Foyth, and running onto a through ball from Bellerin through said gap. Realising this problem, Pochettino switched to a 5-2-2-1 in the 62nd minute, with Dier dropping from holding midfield to help fill the gap between Foyth and Vertonghen. The near system match up created a checkmate period for the following 10 minutes. With the similarity between the two structures creating a natural access for both sides, neither was able to create a settled rhythm. Arsenal’s back three had issues in building up, with each of Kane, Alli and Son able to press whilst blocking access to midfield spaces behind them. The wider centre-backs, Holding and Mustafi started to move deeper and wider when Sokratis was in possession, to increase the distance between them and the nearest Tottenham forward. However, these positions meant they had worse angles and bigger distances to their passing options higher up, and were ultimately easier to isolate against the touchline. In the 71st minute, Emery used the opportunity of Mustafi’s injury to make a final structure change, bringing on Guendouzi and moving to a 4-diamond-2. The interaction between Arsenal’s back four in build-up and Tottenham’s front 3 was far more suitable to progress stably. With Bellerin and Kolasinac deeper and out of the Tottenham wing-back access area, Son and Alli could no longer press Arsenal’s centre-backs as aggressively, wary of the full-backs outside them. This gave Holding and Sokratis more time in these situations. As the away side moved to a back 3, Aubameyang and Lacazette’s focus on playing in the full back-centre back channel meant they played increasingly wider. In the final 3rd, they were at times even found outside Tottenham’s wing-backs. As 8s in the diamond Torreira, who had become increasingly offensive as the half wore on, and Guendouzi were well positioned to run through channels in Tottenham’s defence, particularly when a forward dropped into deep or wide positions. With these “opposite movements”, Arsenal could bypass the typical man-oriented defending in a 5-chain. 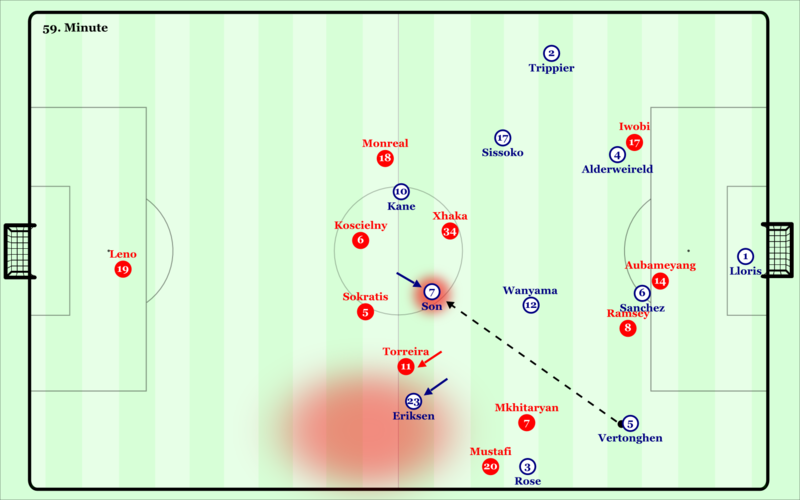 Emery’s side made several concerted efforts to break through these channels with outside-inside attacking moves, including underlapping runs from the 8s, and at times the full-backs when the ball was wide. It was eventually one such run from Torreira, which gave the Gunners the crucial 4-2 lead, and with similar movements they threatened to add to this score. Tactical battles are often referred to as similar to chess matches, given the continuous act and react flow, and this game was a defining example. An interesting note, is how the teams started with particular formations, and over the adaptations during the game, ended with the base formation that the opponent started with. Arsenal starting with 3-4-2-1 and ending in 4-diamond-2, with Pochettino’s side moving the opposite way. Ultimately, Arsenal were worthy winners, with Emery’s ability to constantly create new threats after Pochettino’s attempts to negate previous ones, proving decisive. Large swings in momentum are a consistent theme with Emery’s sides, which is partly due to his ability to analyse and solve problems in play. Throughout the first half, Tottenham’s build-up was forced around Arsenal’s block, with the home side unable to access their midfielders and play through Arsenal’s press. As such they were largely comfortable for the guests to defend against. One contributing factor, was the well organised midfield press from Emery’s side, with particularly good work from Ramsey. With Tottenham’s back three in possession, Ramsey constantly adjusted his position to block the lane from the ball to Wanyama behind him. 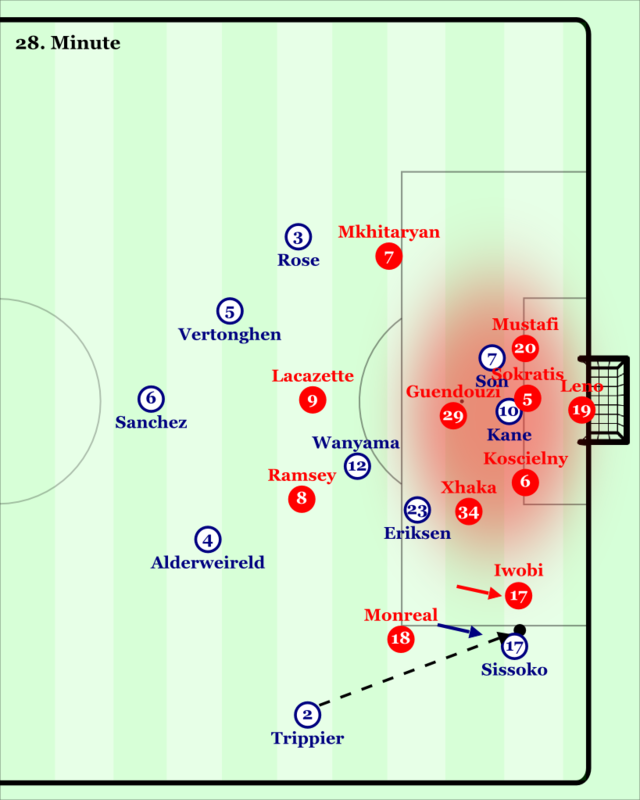 Lacazette waited for back passes from Alderweireld/Vertonghen to Sanchez to become active in pressing, and in such moments Ramsey would also push forwards to press the next receiver, still maintaining Wanyama in his cover shadow. With Vertonghen or Alderweireld in possession, Arsenal’s wingers would move wider to block the lane into the wing-back on their side, also moving towards the ball when close enough to press. This made chipped passes over them far more difficult. Behind them, Monreal and Mustafi moved up slightly ready to press the receiving wing-back if Tottenham attempted a chipped pass. Guendouzi and Xhaka were also well positioned to cover the 10 space, close enough to the defence to prevent passes behind them, but also high enough to move up and press if Wanywama or Sissoko received the ball. Yet Tottenham’s midfield dynamics and decisions were poor and enhanced the effectiveness of Arsenal’s structure. Wanyama lacked effective movement to evade Ramsey’s cover shadow. With Wanyama usually moving towards the ball and Ramsey moving to block him, there was often space for diagonal passes behind Lacazette, yet Sissoko constantly failed to adjust his position to take advantage of this. Pochettino’s side also lacked a permanent structure to target spaces in Arsenal’s midfield, with Sissoko not permanently forming a double pivot to play either side of Ramsey. Unable to play wide or through midfield, the only options usually available to Vertonghen and Alderweireld were a long switch to the far side wing-back, or to switch again through the back line where they usually faced the same problem again. However, the decisions from Tottenham’s defenders were far from flawless. They often failed to use the few moments where lanes to Wanyama or Sissoko were open, giving Arsenal time to regain their structure, before switching yet again. In a few situations, usually after a number of switches, Iwobi or Mkhitaryan weren’t wide enough to block the pass to the wing-back behind them, with Rose or Trippier thus open to receive. However, Arsenal also defended these situations well. The near winger would work back quickly whilst blocking the back pass, whilst Mustafi or Monreal stayed deep and wide preventing them dribbling too far, the near holding midfielder would also move across blocking inside options and adding to the pressure. With this defensive triangle, Emery’s side were often able isolate the ball on the wing. The best routes of progression for the hosts tended to be when they played long balls behind Arsenal’s defence for diagonal runs from the far striker. This forced Arsenal’s defence to drop to deal with the duel, opening space between them and the midfield for the near striker to drop and win 2nd balls. With the previously analysed build-up problems, Tottenham mostly arrived in the final 3rd on the wings without a clear time and space advantage. The away side spent long periods defending their box and the areas around it, but conceded hardly any chances. Tottenham’s approach in the final third was heavily right side focused, using Trippier’s positioning to open room for underlaps or diagonal runs to break through channels in Arsenal’s back line. Initially Arsenal would wait for Iwobi to work back and press the English wing-back, with Monreal mostly staying inside ready to defend the near post against crosses, or moving to the edge of the box to support Iwobi if Tottenham sent another player out wide. In moments where Iwobi’s previous position was narrow, Monreal would move out to press Trippier. Iwobi would then drop to cover the space inside and behind him. As such, the hosts rarely arrived to positions near the box with an advantage. Yet even when they did, Arsenal were well positioned to defend the box, with Xhaka and Torreira defending cut backs, and a constant overload around Kane. When Monreal was pulled out, Koscielny was able to defend the near post whilst helping Sokratis congest the space around Spurs’ talisman. In crossing situations, Tottenham often lacked runs to the near post to draw Koscielny away from Kane, or attack low crosses. Despite their wide positions, Rose and Trippier didn’t attack the far post often, meaning Arsenal’s far full-back could defend narrower further congesting the centre of the box. Whilst the Gunners defended well, flaws in their structure, as well as increasingly risk-averse decisions in possession meant they did not hold onto the ball for long, and thus spent large parts of the period deep in their own half. Arsenal’s possession game thus wasn’t a prominent factor in the first half, but directly impacted how much defending they had to do. With Tottenham’s play mostly leading to the wings, most of Arsenal’s regains were initially in wide areas, with resulting dribbles from Iwobi quite easy to isolate due to the heavy underload. However, when Arsenal were able to play the furthest available pass in central areas, they had dangerous counter attacks. If the receiving player, often Ramsey or Lacazette, could hold the ball and give time for supporting runs from their team-mates. Mkhitaryan’s movement inside from his right wing spot to receive and dribble through the centre drew Tottenham’s defenders towards the ball, leaving room outside them for wider attackers. After the interval, Pochettino made a number of adjustments to the player roles with the aim of playing around Arsenal’s midfield pressing. Eriksen now started consistently higher in the left half space rather than his freer role as a central 10 in the first half. The wing-backs, on the ball side in particular, started deeper closer to the centre-backs in build-up, and would drop further to receive the ball. Having tried the right to no avail, the hosts’ attacks were now mainly down the left side. With the deeper positioning of Rose, it was no longer possible for Mkhitaryan to cover him without completely opening the half space for Eriksen. Mustafi thus had to move higher earlier, aiming to arrive on Rose’s first touch and prevent him turning. Eriksen now attacked the space the German defender left behind, and in moments where Rose could turn, received lobbed passes in this space. On occasions where Arsenal used Torreira to track this outwards movement, Arsenal’s cover in front of the defence was reduced, and Son or Kane could drop to receive. These changes led to quicker progressions, but not yet scoring chances, with Sokratis quick to move out to cover, whilst Mustafi dropped back centrally. With an additional run behind Sokratis, Tottenham could have pinned the Greek defender, increasing the space afforded to Eriksen upon receiving. On the 70thminute mark, with his side still trailing, Pochettino moved to 4-2-3-1, with Rose moving to left holding midfield alongside Sissoko, Son to right wing, Eriksen narrow on the left, Lamela as a 10 and Vertonghen as left-back. The move was presumably intended to give an extra option in the 6 space around Ramsey, as well as more presence in offensive spaces. Rose’s positioning helped his side play through, particularly with Aubameyang worse at cover shadowing than his predecessor Lacazette. The Englishman however, lost the ball several times often by attempting to dribble through several opponents without proper manipulation, or poor awareness of opponents’ positioning when passing. On the right, Son played outside Monreal, meaning Trippier could stay slightly deeper. Vertonghen on the left moved high and wide, with Eriksen playing inside. Yet, almost immediately after this move, Mkhitaryan dribbled through the space behind Vertonghen on a counter attack after Rose lost possession, eventually playing Aubameyang through behind Sanchez. Given the Armenian’s threat in transition, Pochettino moved Son to the left to allow Vertonghen to stay deeper. 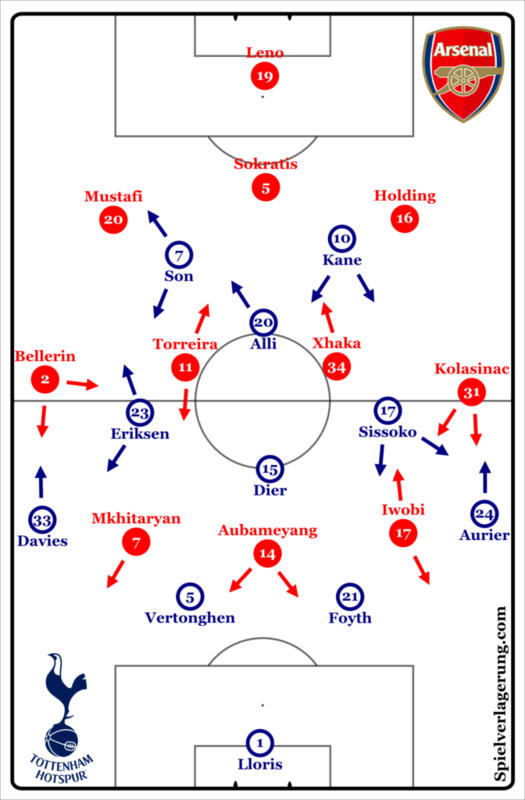 However, when Son was subbed for Llorente, and Tottenham played with narrow wingers on both sides, the full-backs moved high and wide to give offensive width, and had problems dealing with Aubameyang’s movements behind the centre-backs, and Mkhitaryan’s diagonal dribbles with a narrower last line of defence. With the introduction of the Gabonese forwards, Arsenal’s counter attacks became more about finding the right time to play him in behind. The striker would often start on the far centre backs outside shoulder, before making a late run diagonally behind them, when his ball carrying team-mate had time to scan the field. One of these moments led to Arsenal’s 90th minute penalty. Across both clashes, Arsenal come away with the better tally of points, and deservedly so on the balance of chances, The overall quality of the first clash was far higher, particularly with the speed and effectiveness of adjustments from both coaches to swing the game in their favour. Whilst Emery’s ability to come up with effective offensive solutions proved decisive in their win in December, Tottenham’s inability to effectively do the same was key here, ensuring Arsenal were comfortable sitting back on their lead. If Spurs’ 2-0 win at the Emirates in the Carabao Cup is included, the scores were level across the 3 games, demonstrating how close both sides are. On a tactical level, the Emery-Pochettino rivalry will be one to watch over the coming seasons, assuming both remain in England.